With fall just around the corner and some leftover fabric, it was only logical that I make Chelsea some leggings for extra warmth. 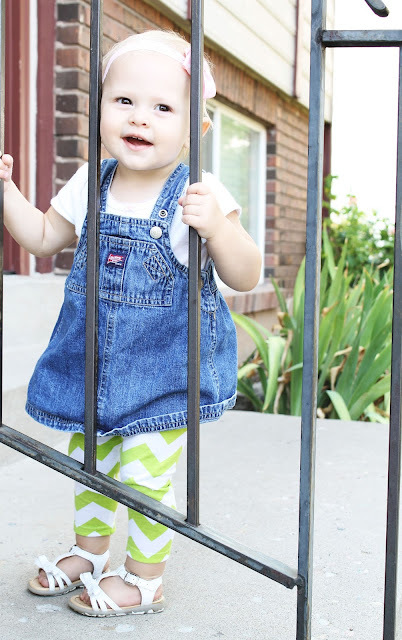 Unfortunately, it appears that I made the lime green ones a little too soon because she's growing right out of them! Are we sure that children aren't actually Grow-in-Water toys? *Note: Double, or Twin needles are really nice because they make your finished product look more neat. 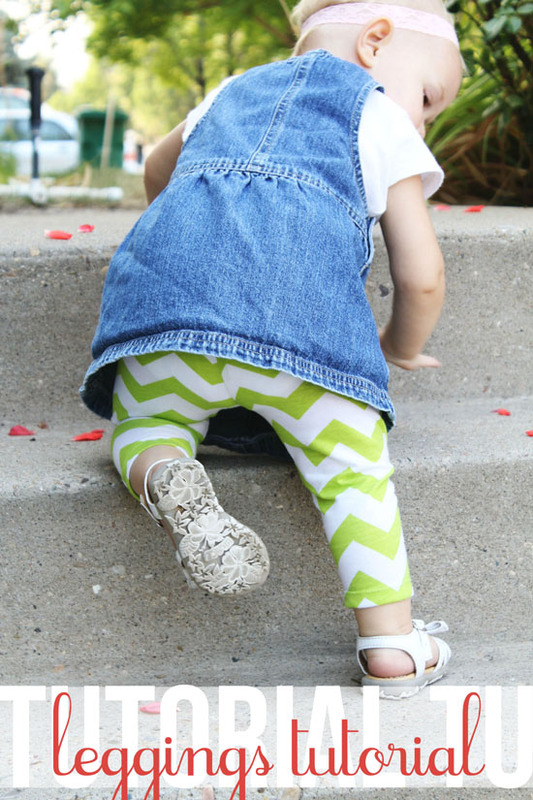 It creates two straight stitches on the top of the fabric and a zig-zag stitch underneath, so it really does three steps in one! Lay your model leggings out flat, then fold them in half on your pattern paper. Align the legs with the straight edge of your pattern paper, then draw around them with 1/4" s.a. down the bottom to the crotch, and the crotch to the feet. Add an extra 1.5" to the top of the pants, and 1" to the legs. Cut out your pattern. 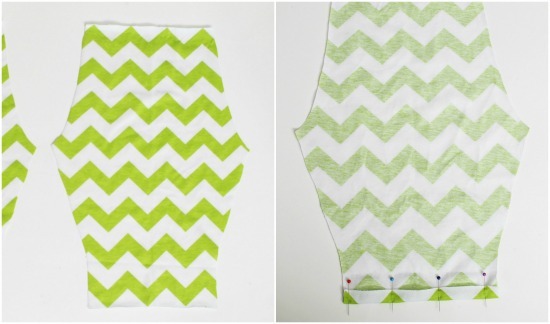 Fold your fabric in half lengthwise. Pin your pattern piece to the fabric with the straight side on the fold. Cut out the fabric. 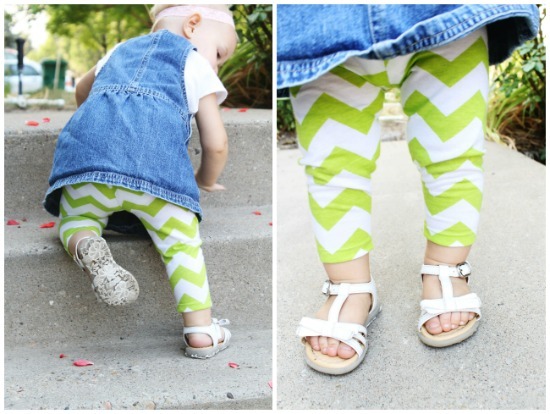 Repeat this step to create another leg for the leggings. Lay both leg pieces out flat. Hem the legs of the pants by folding the bottom of the legs under 1" and using a double needle to sew in place with 3/4" s.a. 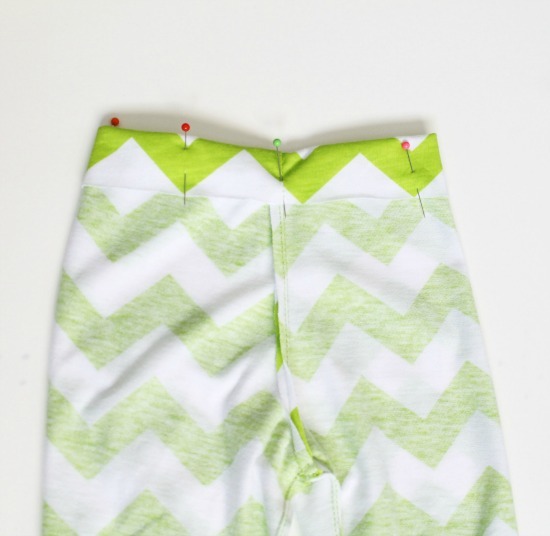 If you don't have a double needle, fold the legs under twice at .5 inch and use a straight stitch to sew in place. Lay one pant leg out flat with the right side up, and lay the other pant leg on top of it with the right side facing down (right-sides together). Pin the two pieces together along the front and back where the crotch and bottom will be. 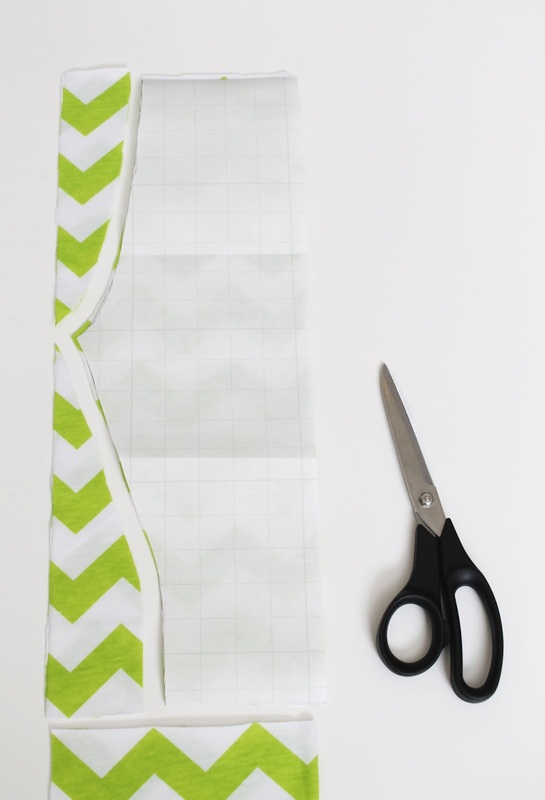 Use a straight stitch to sew, followed by a zig-zag stitch on the outside of the straight seam to prevent fraying, or use a double needle, both with a 1/4" seam allowance. 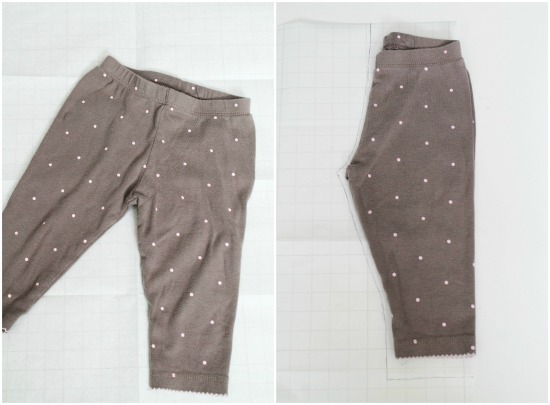 Now, with right sides still facing each other, lay out the leggings so that you are no longer looking at the side of the pants, but the behind of the pants, or the front. 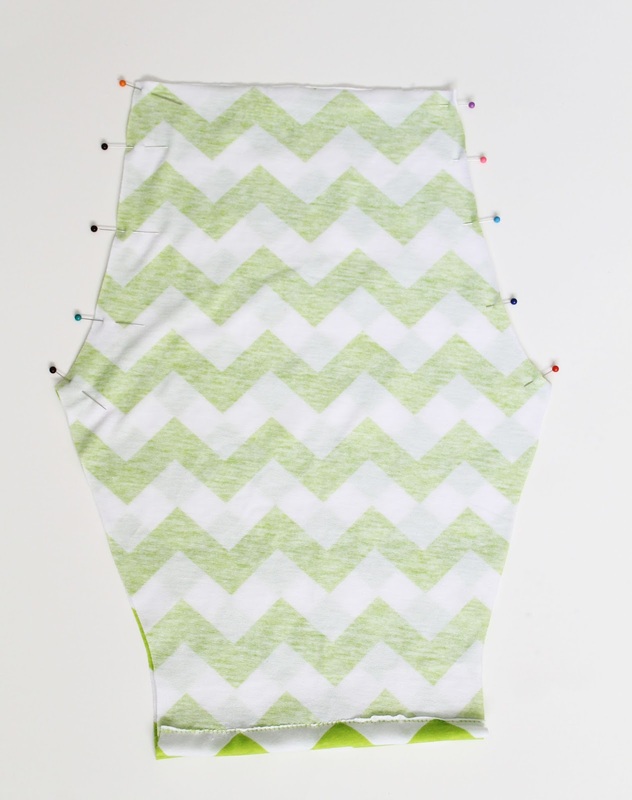 Pin each leg to itself and use a straight stitch and zig-zag stitch, or a double needle to go around the legs and crotch to sew closed. 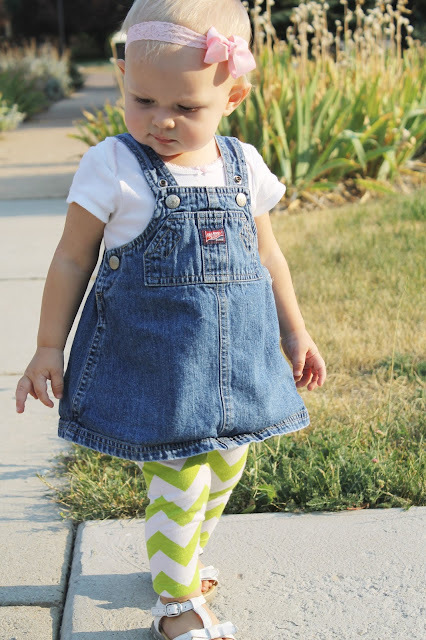 Measure how long your child is around the waist using a measuring tape, or just holding the elastic around her waist to see how wide she is (My daughter is 19"). Set the elastic aside. 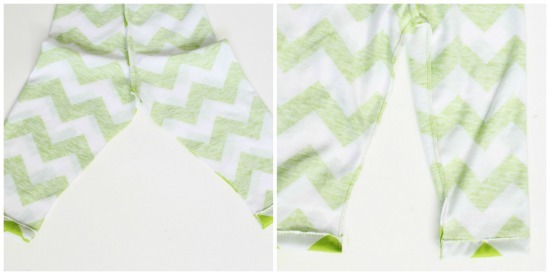 Fold the top of the leggings under 1.5 inches and use a double needle to sew around the entire pant opening except for two inches in the back (fold the top of the leggings down 1" and then .5" under if you're using a straight stitch). Slide your elastic through the casing (the tube that's now in the waistband). Overlap the ends by 1 inch and zig-zag stitch them together. 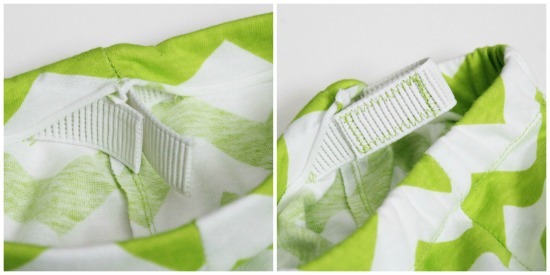 Then sew the 2-inch bit of waistband that you left open to insert the elastic closed, with the elastic safely inside. Get ready for fall! 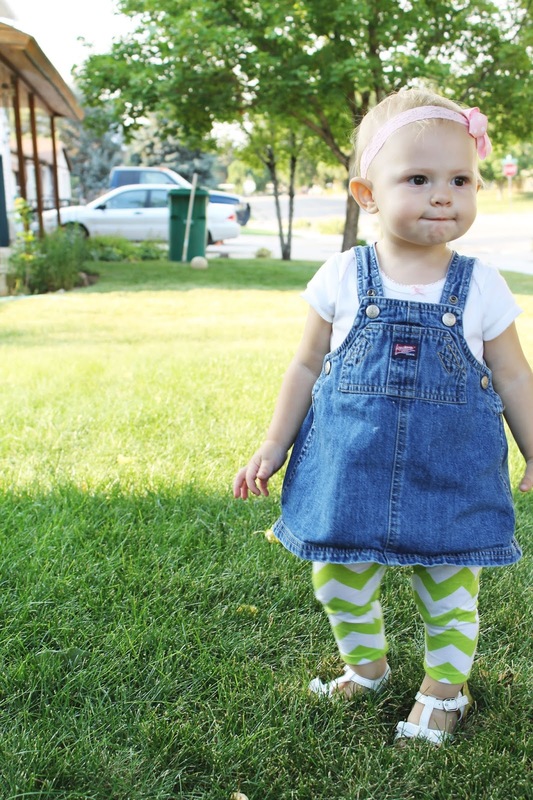 It's crazy how much faster time goes when you've got little ones, don't you think? I can't believe that school is already starting again and that fall is nearly upon us! For some people, the beginning of the school year is exciting, and for some, it's not. Either way, be sure to stop by The Girl Who Loved to Write and enter the giveaway. It's sure to brighten your back-to-school mood! Thanks for stopping by and happy sewing!